I am continuing my series of crappy photos of recipes that taste fantastic. This time, featuring Amarone risotto. It. Is. A. Keeper. 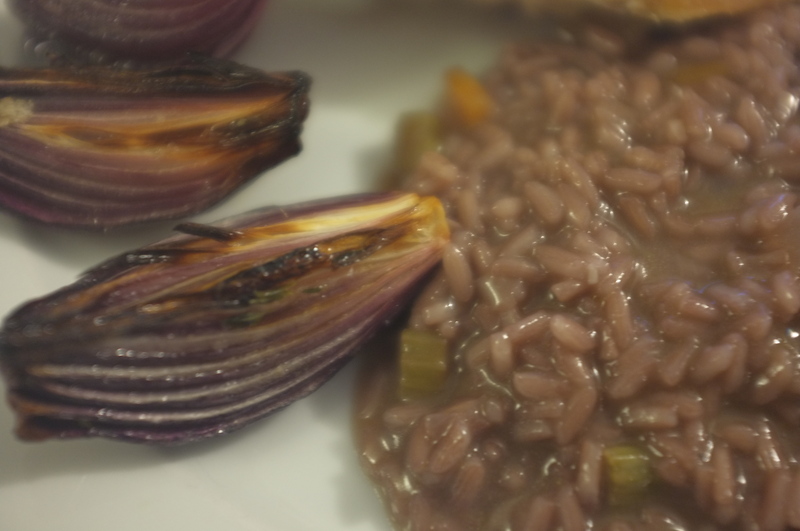 We firsh had Amarone risotto on our Tuscany trip, and we made a firm decision to make it at home. To make it, I followed the basic risotto recipe.1 Sauteé the onions, carrots, garlic, and celery really well, add the rice, to fry it up a bit, and then pour about 300 mL of wine for 200 g of rice. Continue adding stock or boiling water until cooked, and finish with parmesan and butter. I served it alongside roast chicken and roast purple onions. And the wine pairing… well, that one even I could not mess up. It was a long long week, so this was a very rewarding way to end it. I suppose the purists would complain about this.